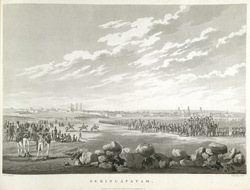 This uncoloured aquatint is taken from plate 19 of Captain Alexander Allan's 'Views in the Mysore Country'. Srirangapatna is on an island in the Kaveri river 20 kilometres from Mysore, and was the seat of one of the best-known rulers in South Indian history, Tipu Sultan (1753-1799). The town's name derives from Sri Ranganatha, an incarnation of Vishnu, whose temple towers can be seen in the distance. Tipu's adventurous and able father Haider Ali (1722 - 1782) had become the leading power in Mysore in 1763 after the death of the Hindu raja. Tipu in turn built up the kingdom into a strong and prosperous state stretching over most of South India. The power of the so-called Tiger of Mysore inevitably clashed with British intentions and the Anglo-Mysore wars reflected this. Ultimately, Tipu died fighting and the British were victors. The figures seen on elephants are Tipu's sons, who were taken hostage in February 1792 when Srirangapatna fell to Lord Cornwallis, concluding the third Anglo-Mysore war.